Massage, relaxation and Healthy flow. Massage & Health - Welcome. Health, Healthy Living, Alternative Health, Treatment, Medicine, Natural Medicine, Swedish Massage, Connie, Deep Tissue Massage, Talk to Connie today. These is all about health - register here for the full story. Assisting the flow in your body, circulating the lymphatic system. Relaxing mind and body, rejuvenating deeply into the soul. You just feel exceptionally well after an hour on Connie’s massage table. But the massage is just the beginning….. 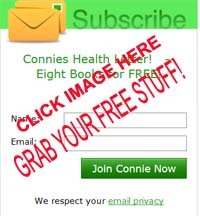 If you really want to be healthy - then Connie and her team can teach you how. Are you prepared to do some lifestyle changes? Send us a message HERE and NOW - and let us give you some initial free information. Here’s a couple of Video’s that explain a bit about the different types of Massage, starting with “Swedish Massage” versus “Deep Tissue Massage”. 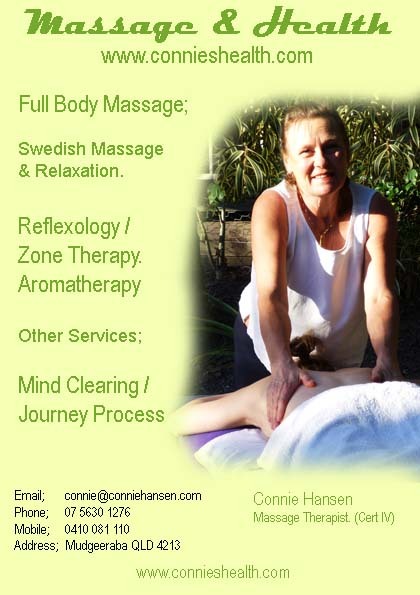 Connie's Health, Massage and Healing. Health and Relaxation, aromatherapy and Reflexology. Swedish Massage, A Short History and Background. Swedish massage was pioneered by a Swedish physiologist, Henri Peter Ling, at the University of Stockholm in 1812. It was introduced to the U.S. in 1858 as "The Swedish Movement Cure." Swedish massage is the foundation for other types of Western massage, including sports massage, deep tissue massage and aromatherapy massage. (also know as Classic massage). It does not really matter who developed it because the strokes are based on massage techniques from around the world. By the 1890s, almost everyone thought they were experts on the techniques of Swedish massages and many physicians and non-physicians had published books with details and illustrations. During this time period, in this short but helpful history of massage, Swedish massage was used extensively in many sanitariums, the precursor for the modern day massage spa. Swedish massage uses gentle but firm pressure to improve circulation and ease muscle tension and pain. Swedish massage is generally what’s considered a full body massage, as it usually works on all major muscle groups in the body. (Some areas such as breast massage are not offered by all therapists.) Swedish massage can increase one’s flexibility because it stretches the ligaments and tendons, and Swedish massage is specifically designed to relax the muscles. It also helps flush the body tissues of uric and lactic acid and other metabolic waste. Massage oil or lotion is used to ensure the smoothness of the strokes. The Swedish massage is best while lying naked on a massage table but partially covered by a sheet. The Swedish massage techniques are the basis for other types of (Western) massages, such as aromatherapy and sports massage. Massage of the muscles helps flush the body tissues of uric and lactic acid and other metabolic waste. It is therefore important to help this by drinking a lot of water after a deep tissue massage, this cleansing is just another benefit of your Swedish Massage session. Swedish massage is the most commonly offered and best-known type of massage. If it's your first time at the spa, Swedish massage is the perfect place to start. Swedish massage promotes relaxation, eases muscle tension and creates other health benefits. It can be slow and gentle or vigorous and bracing, depending on what the therapist wants to achieve. Feel free to state your preference for pressure during Swedish massage. It can range from light to firm. Swedish massage usually includes some deeper work on areas of specific muscle tension. If you want more intensive work and firmer pressure, ask for a deep tissue massage. Full Body Massage, as opposed to specific target problem area massage, (Ie; injury and sports massage.) is the most common spa massage therapy. This starts with a gentle stretch of the back muscles, followed by a through and full back side massage, including legs and feets. The client then turns over to lie on the back and the massage is continued on the front; feets, legs, followed by a gentle stomach massage and upper chest muscles. The massage is normally completed with a scalp and facial pressure point massage. Relax Firm Muscle v Rocks Relaxation Massage. Please talk to your Massage Therapist when you book your massage session, as mentioned above there are endless levels and combinations of massage. From a very soft stroking massage with soft music and Aromatherapy, through to sport massage and the softening of hard and tense muscle tissue. 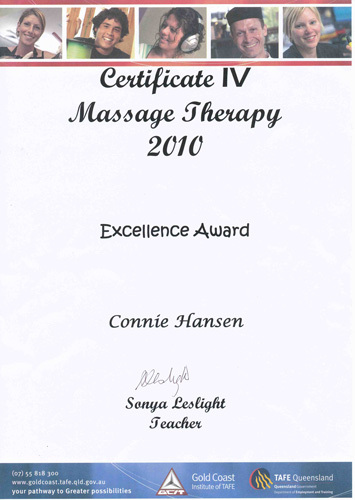 "The most cost effective employee benefit you'll ever have for your office"
Connies Health massage therapists are experienced professionals. 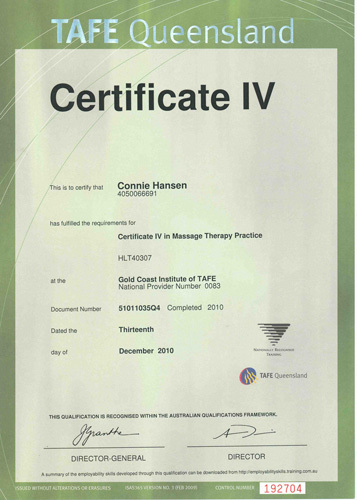 Fully accredited, qualified and insured in seated massage, our services are available on the Gold Coast, and only after special arrangement in other areas. Office massage plays a vital role in managing your staffs’ stress levels. A 15-minute seated massage decreases job stress and significantly increases alertness, focus and work productivity. Workplace seated massage is a time efficient and healthy solution to many common workplace ailments. Corporations and government departments, large and small, use massage in the workplace to keep staff performing at their best. Take care of your most important workplace asset with a corporate seated massage and experience the results first-hand. A healing through nerve relaxation. The Massaging process is the same, but can be known and presented as either Reflexology or Zone Therapy. The massage focusing on the nerve endings in the foot, a relaxation massage that connects to all and any organ in the body. A hands on approach to your health and well-being. The feet and hands are considered as a 3-D map of your body. Stimulating the reflexes under your feet will clear away accumulated toxins and restore your natural energy flow. It is important to work the whole of the foot to promote homeostasis throughout the entire body. Congested or tender areas may be given some extra attention but the entire body should be encourage into proper balance by giving a full treatment. The treatment starts with a warm aroma footbath and a gentle warm up of the ligament and tendons in the feet, relaxing stretches and wringing of the feet, right foot it covert to keep warm while the therapist work on the left foot. When both feets been treated a nice foot balm is massaged in to both feet. The concept of aromatherapy was first mooted by a small number of European scientists and doctors, in about 1907. In 1937, the word first appeared in print in a French book on the subject: Aromathérapie: Les Huiles Essentielles, Hormones Végétales by René-Maurice Gattefossé, a chemist. An English version was published in 1993. In 1910, Gattefossé burned a hand very badly in a laboratory explosion. The hand developed gas gangrene, which he successfully, and intentionally, treated with lavender oil. Aromatherapy is the treatment or prevention of disease by use of essential oils. Other stated uses include pain- and anxiety-reduction, enhancement of energy and short-term memory, relaxation, hair loss prevention, and reduction of eczema-induced itching. All in the name of Healthy Living!